Lyle: This is a classic progression used in the blues/rock style. Try this with either super clean or slightly distorted tone, add chorus and a little bit of reverb. Lyle: Here's another way of playing the 3 basic chords. This is what I like to call the "Hendrix rhythm style" type of riff. 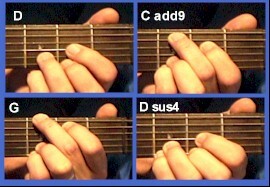 Your index finger is used to bar across the 5th, 4th, and 3rd strings. Lyle: All three chords are related to each other. They all happen to be in the key of G major. D is the V chord, C is the IV chord and G is the I chord in G. Since the chord progression starts and ends on the D chord, you should center your soloing around the D by using D pentatonic scales. Lyle: Your turn! Try playing the D major pentatonic scale and this solo example along to the looping jam track. Lyle: I can hear ya! Lyle: The major pentatonic against the major chord gives you a strong sound. To get a blues-ier sound, try the minor pentatonic against the major chord. Lyle: Thought I'd give some of you a little challenge. Lyle: Good idea Support, thanks. You can 1) slow the TAB down, 2) slow the jam track down. Lyle: So you can use both the major and minor pentatonic scales against this blues jam in D.
dh: The chord arrangement is close to Bon Jovi "Wanted Dead or Alive"
Lyle: The mixolydian mode is the dominant scale. It is the 5th mode of the G major scale. Lyle: Try playing all 3 solo examples back to back along to the jam track. This will help train your ear to recognize the tone difference between the three scales used. dh: Is there a certain chord that makes it easier to switch from the major to the minor pent? Lyle: D is the V chord, C is the IV chord and G is the I chord in G.
Lyle: So when you have the chance to play a jam against the V chord like this, both major and minor pentatonics can work well with each other.